While the rains begin pouring down on the rest of the Philippines, spring is giving way to summer in Batanes. Yes, it's summer in Batanes. In fact, locals say that summer in Batanes is from June to August. While there may be some occasional rains, one must not forget that Batanes has four seasons due to its close proximity to the temperate region. In fact, it's closer to Taiwan than it is to the rest of the Philippines. Don't be discouraged by rainy Manila because now is the best time to visit Batanes! We were just there last week. And I'll be talking about it in the next few days. 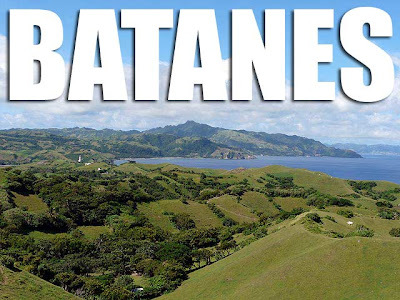 Rich in heritage, scenic views and beautiful beaches, Batanes is a must visit for anyone. Book your trip now at www.flyseair.com or call SEAIR Reservations at (02) 8490100. For packages call SEAIR Leisure Escape Packages at (02) 8437308. Issue 2 of Northbound Magazine is out! 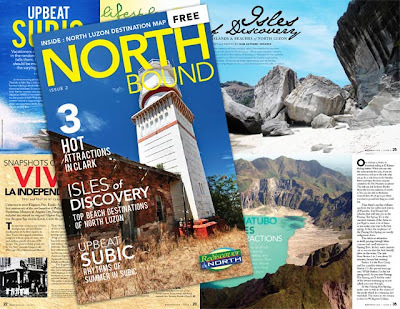 Issue 2 of Northbound Magazine, a free quarterly travel guide to North Philippines (Ilocos Region, Cagayan Valley, the Cordilleras and Central Luzon), will be available in hotels, restaurants and information centers around the region beginning next week. This magazine is a publication of the North Philippines Visitors Bureau. You can download the online version from www.northphilippines.org. Bring out your Philippine flags! It's National Flag Day 2009! "SECTION 7. The flag shall also be displayed in private buildings and residences or raised in the open on flag-staffs in front of said buildings every April 9 (Araw ng Kagitingan); May 1 (Labor Day); May 28 (National Flag Day) to June 12 (Independence Day); last Sunday of August (National Heroes Day); November 30 (Bonifacio Day); and December 30 (Rizal Day); and on such other days as may be declared by the President and/or local chief executives." 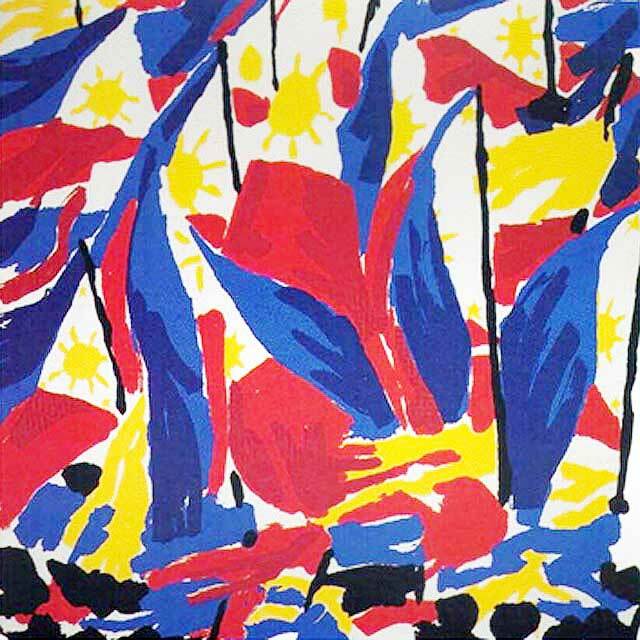 May 28, 1898 was the day the Philippine flag was first unfurled near the port of Cavite Nuevo after the victory at the Battle of Alapan, where the Philippine Revolutionary Army lead by Aguinaldo defeated the Spanish Army. This day is recognized today as National Flag Day. As one Filipino nation, let us display the Philippine flag outside our homes and offices from May 28 (National Flag Day) to June 12 (Independence Day)! For the proper display of the flag, please read RA 8491. The painting above is one of my favorites from Claude Tayag's Fiestas serigraph series. It's called Hunyo 12. In fact, I have one displayed in my room. Vigan, Ilocos Sur is one of the grandest showcases of Philippine architectural heritage. 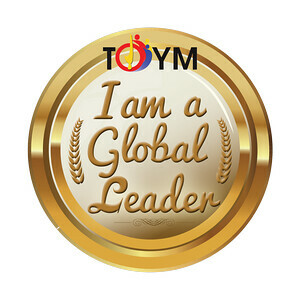 And we what made it extra special was that Vigan was celebrating Tres de Mayo, an annual festival of thanksgiving, plus the Viva Vigan! Binatbatan Festival of the Arts. We made our way down to Vigan from Pagudpud. But stopped over at Saramsam Cafe in Laoag for more Ilocano pizza. We were delayed a bit because of a minor road mishap. But we arrived in Vigan just in time for the street dance parade that was making its way through this UNESCO World Heritage City. The Viva Vigan! 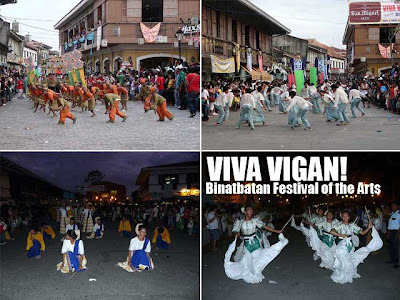 Binatbatan Festival of the Arts is a cultural showcase of the city that was first organized in 1993 to coincide with the Tres de Mayo festivities. The centuries-old structures along Crisologo Street were all decorated with abel iloko cloth or inabel to mark the celebrations. 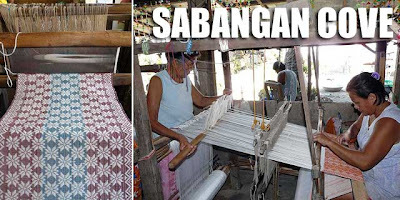 The binatbatan street dancing started in 2002, with dancing mimicking the traditional Ilocano way of beating the cotton pods with two bamboo sticks, the first process in making inabel. This beating was done to separate the seeds from the fluff. Anyway, the parade went on until evening after which we proceed to an old house for dinner. 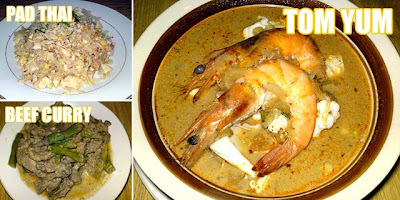 I'll tell you more about dinner in another posts dedicated to the food we feasted on in Vigan. 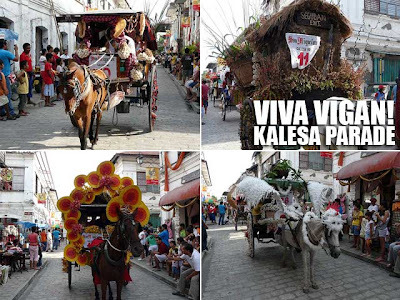 The next day was Tres de Mayo, a centuries-old fiesta of Vigan citizens to honor the Santo Cristo Milagroso or Apo Lakay. There is actually an early morning Mass at the Simbaan a Bassit or Vigan's Cemetery Chapel to open Tres de Mayo. We walked around Vigan in the morning and got to appreciate the decorations along Crisologo Street. Lunch was at Hidden Garden and just like dinner, I'll talk about it in another post. Before proceeding back to the poblacion, we stopped by the pagburnayan or the pottery area of Vigan. We were lucky because it was Fidel Antiporda Go, named a National Folk Artist by the NCCA in 1990, who did a demonstration for us. The burnay was actually introduced to Vigan by early Chinese traders even before the arrival of the Spanish colonizers. In fact, Go still speaks fluent Hokkien. It served as an all-weather container for local products for shipment ot China and other areas. It's also used for the fermentation of fish sauce, vinegar and basi wine. Back in the heritage district, we visited the Syquia Mansion, the home of Pres. Elpidio Quirino's wife and repository of a good number of his memorabilia. It's declared by the National Historical Institute as a Heritage House. 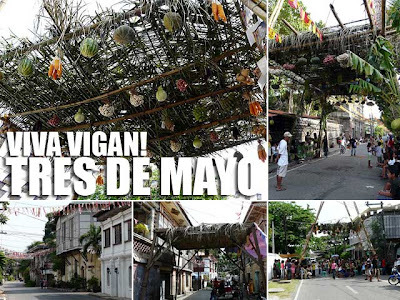 While our group was in the house, I walked around to check out the ramadas or makeshift canopies decorated with produce that were constructed around the city as part of Tres de Mayo. The ramadas become focal points for each neighborhood during the afternoon since traditional Filipino games are organized for kids and kids at heart under these canopies. 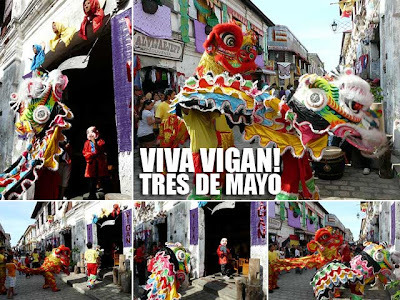 Vigan's Chinese roots became evident in Crisologo Street as a lion dance troupe made its way around the various shops owned by Chinese-Filipinos. But there were no fire crackers though which always accompanies this practice. Late in the afternoon, a calesa parade made its way around the city. 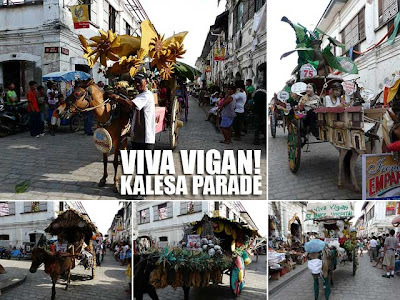 Each calesa was decorated with everything Vigan and is one event of the festival you should not miss. What was lacking though was a marching band. And San Miguel, being the sponsor of this parade, should have made sure there was a marching band to make the parade even more festive. Were they cutting on costs like most corporates do when they beg organizers for exposure during these festivals? Oh well! Before we left for Manila, we made one last stopover at Abuelita's Restaurant for a taste of traditional Vigan street food. There was a santacruzan and procession later in the afternoon but we had to rush back home. That was one long drive! 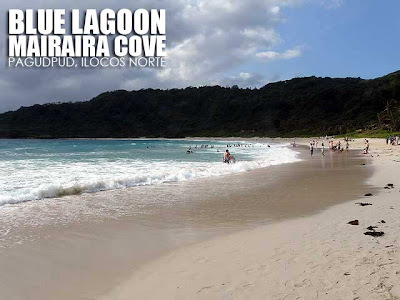 Mairaira Cove or Blue Lagoon in Pagudpud, Ilocos Norte is one of the best beaches in Luzon. A little further north from touristy Saud Beach, its immaculate blue waters entice visitors for a swim. We arrived in Mairara Cove just in time for dinner at the Kapuluan Vista Resort where we were staying for the night. On the buffet menu was a bevy of grilled dishes. 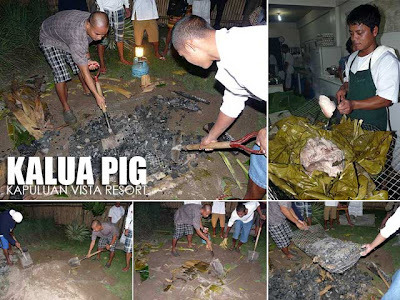 But the highlight of dinner was kalua pig (pork roasted the traditional Hawaiian in a makeshift underground oven). The next morning, we walked over to Blue Lagoon which was five-minutes from the resort. The sand was soft and the waves were a bit strong. Being a holiday, there were a good number of visitors. There were also some surfers riding the swells further away from the beach. Mairaira Cove is a popular haunt for surfers. In fact, the resort offered surfing lessons. If we weren't leaving early, I would have taken surfing lessons for an hour or two. At least we were blessed this weekend with sunshine amidst this weird summer weather. After packing our bags, we went back on the road and drove further north to the Patapat Viaduct for a photo opportunity. From there, it was back south to Laoag City. 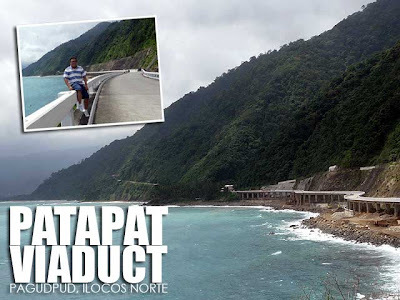 Ilocos is a favorite destination for road trips. And I found myself driving up to Pagudpud again, the northwestern tip of Luzon. On the way up to Pagudpud, there are several interesting stops along the way. Tagudin, Sta. Lucia and Candon have interesting old churches. Candon City is known for its brown and white sweet calamay which is most definitely worth a short stop. Stalls are located in front of the city plaza along the National Highway. Our first stop on the way was Sabangan Cove (also known as Santiago Cove) which is known for its weaving village. You'll get a chance to see how abel iloko is woven. You can also purchase on the spot but make sure to haggle since starting prices here are higher than Vigan (the good thing about Vigan is the local government ordered standard pricing even along Crisologo Street). Another stop you should not miss is the Sta. Maria Church, a UNESCO World Heritage Site. We skipped Vigan and Bantay since we planned on passing there on the way back. 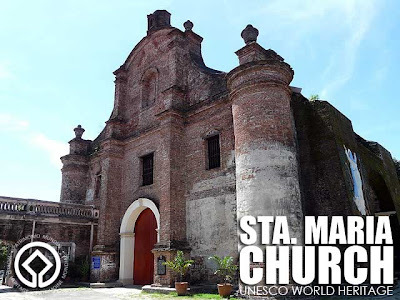 And we also missed Magsingal Church (a National Cultural Treasure) and the Sinait Church due to time constraints but if you have time, it's also worth the stop. 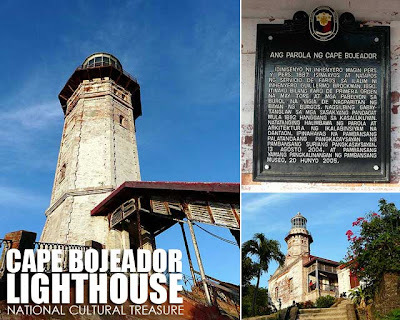 In Ilocos Norte, the first stop is usually the Juan Luna Shrine and Badoc Church. But we went straight to Batac to visit the Marcos Mausoleum and savor Batac's famous Ilocos empanada. 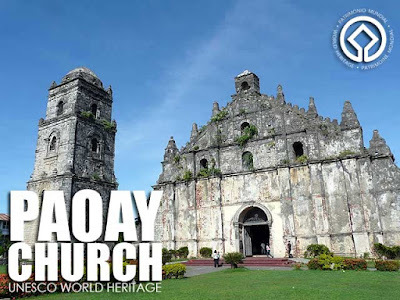 From Batac, we proceeded to Paoay Church, another UNESCO World Heritage Site. In front of the church, is Herencia Cafe where we had lunch. 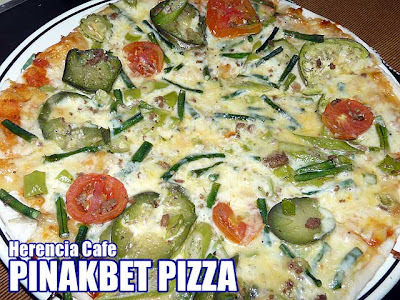 The best seller of course is the Pinakbet Pizza and the other Ilocano fusion pizzas. If you have time, you can also pass by the Ilocos Norte Sand Dunes, a National Geological Monument, Lake Paoay, and Fort Ilocandia. 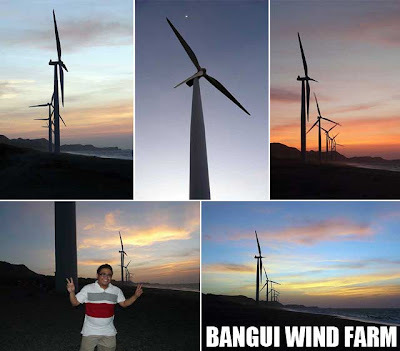 We even had to skip Laoag to get to Bangui Wind Farm before sunset. We stopped by the Cape Bojeador Lighthouse in Burgos, a National Cultural Treasure, and were able to arrive in the nick of time at the Bangui Wind Farm to enjoy the magnificent South China Sea sunset. So with that down, we made our way to Mairaira Cove in Pagudpud where we stayed for the night. 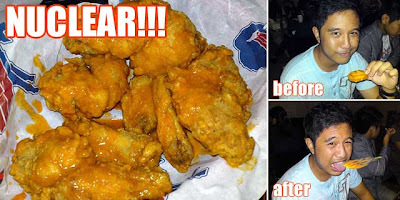 Manila: Buffalo's Wings N Things serves nasty wings! The Ortigas Home Depot area is turning out to be a great place to dine and hang-out. 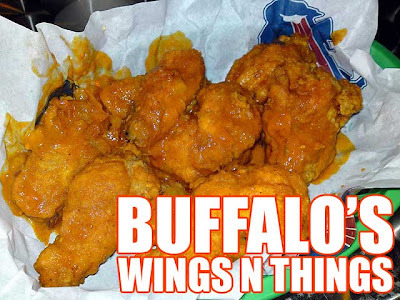 One of the places we got to try out is Buffalo's Wing N Things. And hell do they serve really nasty wings! They currently have nine sauces and you can order half a pound, one pound or the triple sampler (three different kids of sauces). I'm not into spicy food so my favorites were New York's Finest (which was mild spicy) and Honey BBQ (3). 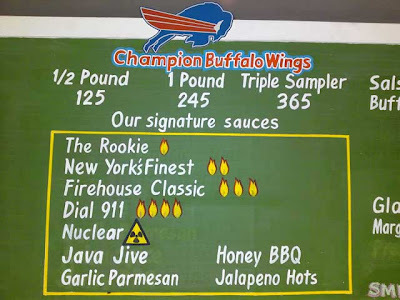 There are five chili levels for the original Buffalo wings flavor ranging from The Rookie to Nuclear! We got to try Rescue 911 (1) and Nuclear as well and boy were they hot! Thanks to Bikoy for the illustration (no acting there). We were also served Java Jive, Garlic Parmesan (2) and Jalapeno Hots (4). 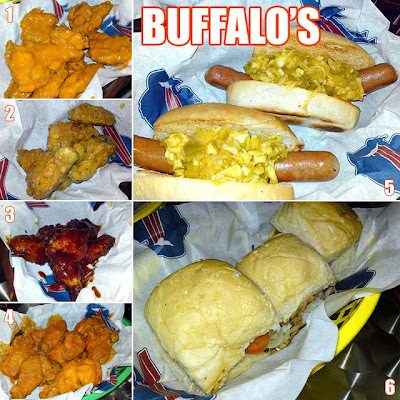 But Buffalo's not only serves wings. Other American comfort foods are available such as Twin Dogs (5), Mini Burgers (6), Fish N' Fries and Philly Cheese Steak. They don't serve rice. But they'll happily buy rice for you at the nearby convenience store if you want your wings to go with rice. During my freshman year in U.P. Diliman, we enjoyed exploring its many culinary secrets. In the International Center, the U.P. dormitory for foreign students, was an unassuming carinderia which served authentic Thai food at very affordable student prices. It was authentic because the cook and owner was a Thai lady whom we all called Mommy Thai. The stall later on moved to Balara and moved a second time before closing shop in 2006. Many were saddened when Mommy Thai disappeared. And in fact, many U.P. students and alumni think Mommy Thai was closed for good. 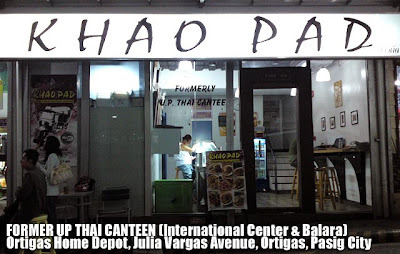 The good news is that Mommy Thai reemerged last year in a different location, the Ortigas Home Depot, as Khao Pad. It went unnoticed even by many of their old U.P. patrons until they placed the sign "formerly U.P. Thai Canteen" on its glass window. Now text messages have been going around from the many excited U.P. students who got to savor her tasty Thai lutong-bahay. 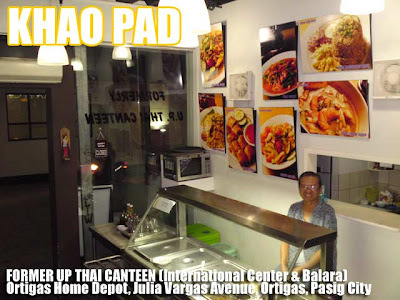 While she serves the Thai dishes we are familiar with such as pad thai, tom yum and bagoong rice, her former patrons can still order the dishes she served in U.P. (take note that these are not in the menu but she'll gladly prepare them for you). And arguably the most popular is a dish she calls Mixed (some call it mixed seafood but it's really mixed beef, chicken, squid, vegetables and egg). 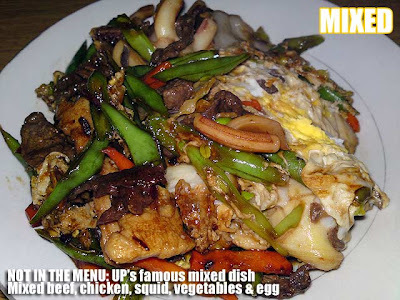 Each dish costs PHP120 and is good for 2 to 3 people. In fact, I ordered Mixed a while ago and it was a lot! The U.P. version was a rice topping dish good for one. I'm going back there next week with my college barkada! 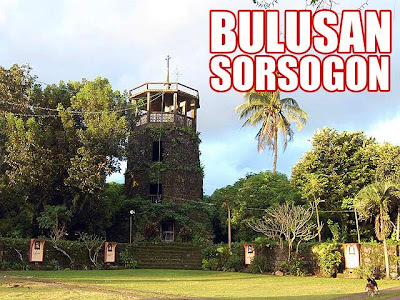 I got an SOS e-mail from Bulusan, Sorsogon. Now it's a gas station being built beside an old bell tower! It seems the Roman Catholic Church, Inc. is unstoppable! This is absurd! Abraham G. Tan writes me, "We have an online group currently working on putting a stop to the construction of a gasoline station in a parcel of land which was originally a portion of the church's outer patio. The gasoline station, once finished, would superimpose itself on the ancient belfry and could only be but an eyesore. Yes, we were told that it indeed was all our current bishop's idea. Thus, we're not really expecting an easy fight. We already sent him a letter, for which we are yet to receive any response." If you want more details, check out the nine page letter the group sent to Most Rev. Arturo M. Bastes, S.V.D., D.D., Bishop of Sorsogon. On the Bulusan belfry, Tan writes in Flickr, "Its original pyramidal dome had been removed and replaced with a new one, the same period (early 1970s) that the old stone church was torn down (don't know if such destruction was really necessary), so I was told. Still, this belfry, the largest of the four baluartes de piedra dotting Punta Diamante in Bulusan, the Moro piracy days defense muralla, the stone fort that encloses the church complex of the Parish of St. James the Greater (one of the oldest in the province, founded in 1630), remains grand in its antiquity." 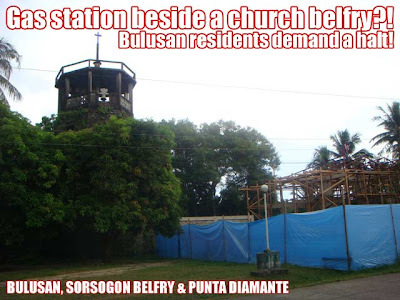 Learning about this development in Sorsogon is very frustrating. When will this ever stop? When will they ever learn?! Pinakbet Pizza, ever heard of that? 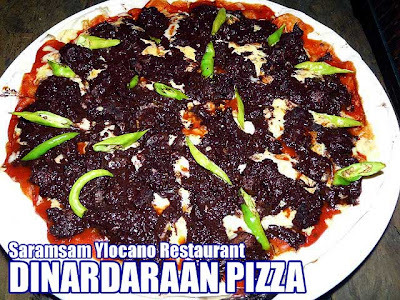 After the Kapampangan pizza at the Camalig (Doy's Delight is topped with longaniza, salted eggs and pickle relish), comes an even longer list of Ilocano pizzas. And we got to taste several of them at two restaurants in Ilocos Norte. In front of the Paoay Church is Herencia Cafe which first served the Pinakbet Pizza, topped with your usual pinakbet vegetables. We also got to try the Bagnet Pizza which is crispy bagnet or lechon kawali (chicharon as they sometimes refer to it in Ilocos) on a pizza, and the Dinuguan Pizza (dinuguan with crispy bagnet). Further north is Saramsam Restaurant in Laoag. 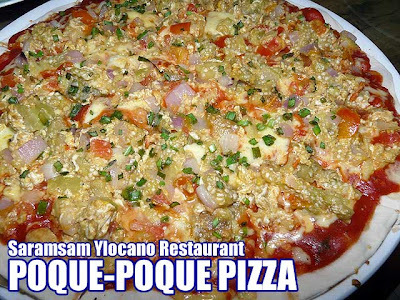 Their specialty is the Poque-Poque Pizza which is topped with poque-poque or poki-poki, an Ilocano eggplant dish (combination of eggplant, tomatoes, onions ang egg). This is really good! We also got to try Dinardaraan Pizza, their version of the Dinuguan Pizza, which is dinuguan topped with green chili peppers. Another of my favorites is the Longaniza Pizza topped with the local Laoag longaniza. They also have Carbonara Pizza topped with Currimao oysters. But I was not able to try that out. There are actually more pizzas to choose from but of foreign influence. So you could just try them out when you're there. 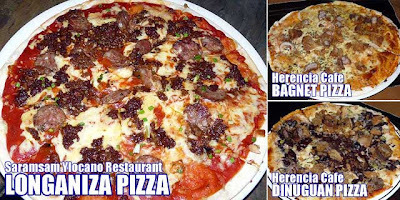 These Ilocano pizzas are superb! Ilocos empanada is one of my favorite Philippine snacks. Every time I go to Ilocos, I make sure to get my share of Ilocos empanada, especially the one in Batac, which is reputably where the best empanada is served. The Ilocos empanada is actually of Spanish and Mexican origin. Notice how it's similar to the taco? The basic empanada has a rice flour or galapong crust with grated green papaya inside. The longaniza, egg and bean sprouts were later added. There are actually two varieties of Ilocos empanada, the one in Batac (which is the same one served in Laoag), and the empanada served in Vigan. So what are the differences? 1. 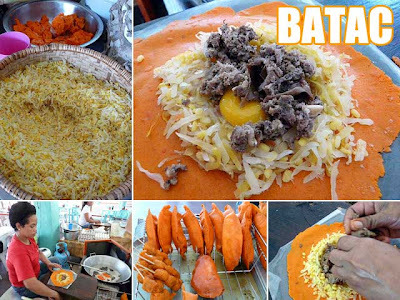 On the crust, the crust of the Batac empanada is orange because of the achuete. 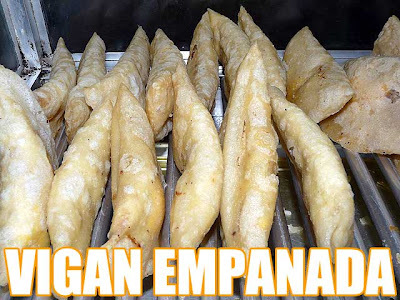 The Vigan empanada has no coloring and is thus lighter in color. 2. The crust of the Vigan empanada is thinner and crunchier. While the crust of the Batac empanada, while crispy as well, is a bit harder the chew. While many people prefer the crunchier Vigan crust, I noticed it retains more oil. 3. The Batac empanada uses the entire egg. In Vigan, many stalls remove the egg white (this practice maybe had something to do with building churches since egg white was an important building material at that time). 4. Longaniza types are also different. The Batac empanada uses the saltier Laoag longaniza. 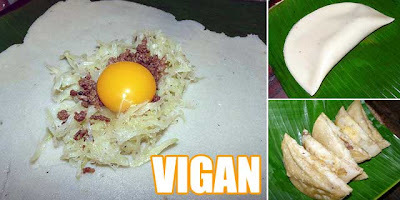 While the Vigan empanada uses the vinegar-seasoned longaniza of Vigan. 5. 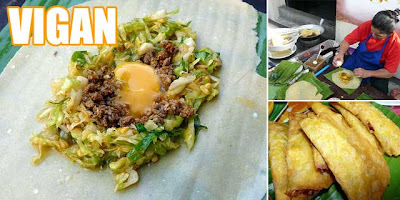 Many Vigan empanadas do not have bean sprouts, just the grated green papaya. 6. The differences in vinegar also add distinctiveness to the two varieties. I noticed the Vigan vinegar is very strong with an alcohol-like fermented taste. The Laoag vinegar is really sour and usually has siling labuyo added to it when served in the stalls. I personally prefer the latter. 7. In Vigan, they still use banana leaves to fold and seal the empanada. In Batac, it's already plastic. 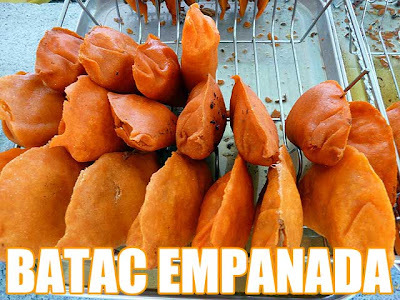 The Batac empanada has a lot of variations. There's the ordinary empanada (just the papaya, bean sprouts and egg), ordinary eggless (just the vegetables), special empanada (with longaniza and egg), special eggless (with longaniza but no egg), special w/o mongo (everything except bean sprouts), jumbo empanada (with hot dog), double special (double longaniza and one egg), double egg (one longaniza and two eggs), and the heaviest of them all, the double double (double the longaniza and egg). They even serve just the crust which they call pinais. In Vigan, one variation we got to taste was the one with cabbage served at Abuelita's Restaurant. I'm looking forward to my next serving of Ilocos empanada! Baguio: Is Baguio a hopeless case? 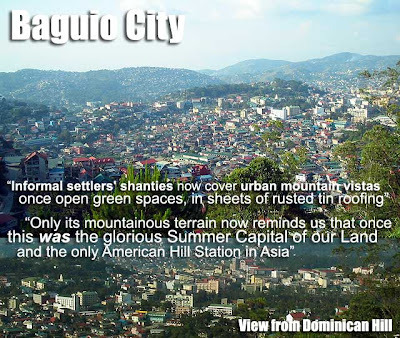 Baguio City is the only hill station in the Philippines. For those not familiar with hill stations, a hill station in Southeast and South Asian countries is a high-altitude town used especially by European colonialists as a place of refuge from the summer heat. It looks like the Spanish were not into hill stations since it was the Americans who established the first and only hill station in the country. And that’s why we have Baguio City which is celebrating its centennial this year. Many of these Asian hill stations (such as Simla and Darjeeling in India, Cameron Higlands in Malaysia, Bandung and Bogor in Indonesia, Dalat in Vietnam, and May Myo in Myanmar) were able to preserve their character. But Baguio, sad to say, was not as the destruction of what makes it unique continues as we speak, with the uncontrolled development and short-sightedness of many businessmen who continue to erase the character of the city in the name of progress and wealth generation. I'm sure they're bound to realize that despite all their money, they can no longer bring back Baguio’s charm. I hope they realize that sooner than later. There are still a few enclaves of Baguio’s original character such as Camp John Hay and the Teachers’ Camp area with towering pine trees and Baguio’s green and white architecture. Those are the colors that define Baguio just like white houses are characteristic of some Greek Mediterranean towns, or the bright pastel colors that define several Latin American capitals. In fact, we’ve long been telling the city that a quick solution to beautify the deteriorating Baguio landscape is by repainting the houses in former mountain vistas using Baguio’s historical colors: white, brown or pink walls with green roofs. Imagine how Quezon or Aurora Hill would look like if all the houses there followed this color pattern? It would be an attraction in itself and worth taking pictures of, the same way we take pictures of mountain villages in Europe. And we are not reinventing anything since those are Baguio’s colors. Shouldn’t it be that when a tourist sees green and white houses and buildings harmoniously mixed with lush pine trees, one should know that he is in Baguio City? “We believe that the City of Baguio is culturally, environmentally and aesthetically unique and different from other cities in the Philippines. We believe that Baguio is the nerve center of four rich and diverse cultures: the Filipino culture in general, the highland Cordilleran culture, the lowland Ilocano culture, and the heritage culture brought about by the Americans during the early 20th Century. “We believe that in the past two decades, the City of Baguio has experienced a substantial degradation of its unique culture, environment and art. We believe that the approval of certain politicians with no respect for the aesthetics and the environment of Baguio to put up concrete structures such as malls, overpasses and flyovers only worsens Baguio City's lamentable decay as a "City of Pines." We believe that this overdevelopment and resulting pollution have to stop. “We believe that due to its unique history and blend of cultures, Baguio can be to the Philippines as Barcelona is to Spain, Chiang Mai is to Thailand, and San Francisco is to the United States: a main center of arts, culture, philosophy, education, tourism, sustainable development and environmental awareness. We believe, therefore, that the City of Baguio deserves to be declared a "Special Heritage Zone," so that the degradation brought about by overdevelopment can be minimized and gradually controlled. We believe that Baguio City's heritage as a center of culture and environmental awareness is a valuable asset not just to the Philippines, but also to the world. But one thing about petitions is that while written well, are not addressed or sent to people who can make it happen. Plus the constant follow-ups and lobbying are not done too. So despite the wide and laudable circulation of this petition, I doubt if it has been sent to the right policy and decision makers. It’s already centennial year and still there’s no one moving. Maybe someone out there is listening; someone who can push the national and city governments to make real efforts to preserve what’s left of Baguio’s charm. That being said, let me say that Baguio is not a hopeless case. Something can still be done. But we all have to realize that it’s the responsibility of all Filipinos to save the character that makes Baguio City uniquely Baguio. The Philippine National Anthem is not a pop song! Martin Nievera, in his rendition of the Philippine National Anthem during the Pacquiao-Hatton fight, violated Republic Act No. 8491 or the Flag Law. Section 37 of the law states: "The rendition of the National Anthem, whether played or sung, shall be in accordance with the musical arrangement and composition of Julian Felipe." Singing the first few lines slowly like a ballad, and then repeating the lines again was the first violation. In the last lines, he made a bigger violation by changing the notes of the National Anthem! For what? So that he could wow and impress the crowd with higher notes? He should have followed the example of Tom Jones who sung the British National Anthem solemnly, very straightforward and with fervor. Nievera should issue an apology at the very least! These commercial singers who are given the task of singing the Philippine National Anthem at international events should be reminded that the main reason they are there is to lead the crowd and the Filipino nation in paying respect to our country and our flag. The Philippine National Anthem is not a pop song! Trying to impress everyone with their voice or how high a note they could hit should be the least of their concerns. And just a note to the people who watched the fight live, what may be allowed for the U.S. flag may be an act of disrespect for the Philippine flag. Each country has its own way of showing respect. And Section 34 (f) of the Flag Law states that it shall be prohibited "to add any word, figure, mark, picture, design, drawings, advertisement, or imprint of any nature on the flag." So no marks or messages on the Philippine flag please! Update: Martin Nievera refuses to apologize. His reaction to the criticism is even more appalling. It's outright arrogant and bastos! I guess he's just too full of himself to apologize. Read NHI raps Martin’s version of RP anthem. Update (05/13/09): A well-written opinion from Ambeth Ocampo on the Martin Nievera issue came out in the Inquirer today. Read Our 'pasaway' culture.